Remember the days when people had a double stroller and an infant car seat to contend with in order to get around. Nowadays, you can make use of a seriously handy car seat stroller combo, as it is one of the most convenient things you can invest in as a new parent. It saves a lot of time and aggravation because all you have to do is release it from its base in the car and click it into the stroller and you’re done. No more messing with harness straps or having to unbuckle a sleeping baby. You just click and go. And there are different types of stroller too. 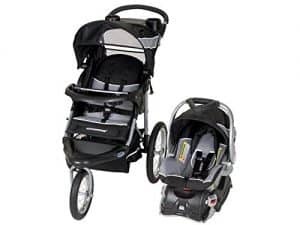 Single strollers, double strollers, triple strollers, umbrella strollers, baby joggers, and car seat stroller combos or ones with car seat adapters to name but a few that all do the same basic thing. A lot of travel systems come with standard strollers, but don’t worry! If you were hoping to find a jogging stroller with the convenience of a travel system, you’re in luck. We found 5 of the best jogging stroller car seat combos out there in 2018. Before we jump right into our reviews, however, we should mention that it’s generally not a good idea to jog with a newborn. 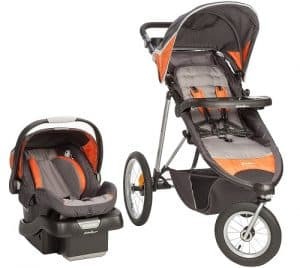 While some jogging stroller car seat combos are specifically designed for jogging when the car seat is in place, most suggest not running with your little one until they are big enough to sit in the stroller on their own. Make sure you follow the manufacturer’s recommendations to keep everyone safe! 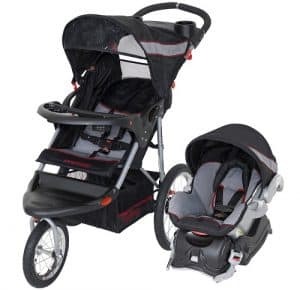 The Baby Trend Expedition LX System comes with a 3-wheeled jogging stroller, a car seat that accommodates infants from 5 to 30 pounds, and the base for your car. The front wheel locks for when you’re jogging but opens up for maneuverability when you’re out and about with your little one. The all-terrain tires make it the perfect baby jogger when your baby is old enough for you to take on a run. There’s also a parent tray with 2 cup holders and covered storage where you can stash your keys or any other small valuables you don’t want to worry about while you’re on a run. The handle is ergonomically designed. It’s wide so you’ll be able to keep a good running stance while pushing it. It’s also padded and really comfortable to hold. It’s great for your little one, too. There’s an adjustable canopy and sunroof to protect him from wind and sun. The car seat easily clips in place while he’s smaller enough to need it but the stroller grows with your baby as well, up to 5 pounds. The seat has a 5-point safety harness, a reclining seat, and reflectors on the footrest so you’ll both be seen in low light. 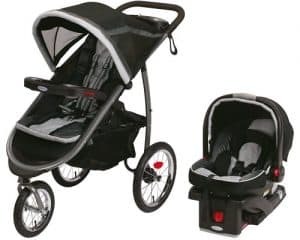 This is the perfect blend of everything mom’s love about Graco’s traditional strollers combined with the features of a great jogging stroller. It weighs about 30 pounds, light enough for one person to lift and put into a car trunk without assistance. It’s really easy to fold up. In fact, you can easily do it with one hand which leaves your other hand free to comfort your little one. The parent tray has two cupholders and a special cell phone cradle that’s adjustable to fit phones of all shapes and sizes. The lower storage basket is really generous, too, with adequate room for your diaper bag, snacks, and other baby supplies. The stroller has air-filled rubber tires for a smooth ride even on uneven terrain. The front wheel locks for extra stability while you’re running. Just unlock it again when you take your little one out for a stroll. The padded seat reclines so your little one stays nice and comfy. There’s an extra-large canopy for sun protection, too, and a tray for your little one. It has compartments to hold sippy cups, snacks, or small toys. You can pivot the tray or even take it off altogether so it’s easier to get your child in and out of the seat. Baby Trend packs a lot of great features into their Expedition Travel System, including a lot of things that your baby will love! The canopy is adjustable and can easily protect your little one from harsh sunlight. Once your baby graduates from the car seat, you’ll find the padded reclining seat is really comfortable. You don’t have to worry about safety, either, thanks to the 5-point harness and tether strap. Thinking about going out in low light? The reflectors will make sure you and your little one are seen. The front wheel of the stroller locks in place for stability when you’re jogging and swivels easily for more maneuverability when you’re just out taking a stroll. The wheels have all-terrain tires that will come in handy when your child is old enough to go for runs with you. You’ll have no problem handling different kinds of terrain. The extra-wide padded handle is ergonomically designed and comfortable to hold. The parent tray sits close to the handle, too, so the 2 cup holders and covered storage will always be within easy reach. For a smooth ride, this Eddie Bauer stroller has 3 rugged air-filled tires on a variety of different terrain. The front wheel locks for the extra stability you need when jogging and unlocks for maneuverability when you’re just out for a casual walk. One thing we really liked about this one is the adjustable handle. If mom is short and dad is tall, the handle can easily be adjusted to keep both parents comfortable. The car seat comes with a base for the car. It moves from the car to the stroller using QuickClick technology. One simple click and the seat is safe and secure. As for the stroller, when your baby is big enough sit in it without the car seat, he’ll love the padded seats and cushioned straps. Plus, the canopy is fully adjustable. You can even move it so it’s in front of your child’s face so you can keep out harsh sunlight or gusty wind from any direction.